By Robert John Weber, Jr.
My movement background is in gymnastics, figure skating and ballet. I’m also a trained teacher in the Gyrotonic and Gyrokinesis Methods. In 1985, when I was in Germany dancing for the National Ballet, I was diagnosed with HIV. At that time, that diagnosis was generally regarded as a death sentence. The doctors told me not to do anything differently, don’t change my lifestyle, just keep smoking, drinking, whatever; and so I did. Then, as things progressed, and we got through the ‘80s and 90’s, which was horrible, my generation was essentially gone. Photo provided by Robert John Weber, Jr.
Luckily, I was non-symptomatic until about 1995. I had little bouts of meningitis in ‘91/’93, and some viral issues, but it wasn’t until 2011, after what was becoming a progressively worsening neurological situation with Meniere’s Disease, tinnitus, vertigo, that things like this that started happening, culminating in spinal meningitis. After about a week in my house, not knowing what was going on, but being very afraid of what this might mean, my family finally got me admitted to the hospital where I was in intensive care for two weeks. The first three or four days were a bit iffy because there was significant swelling in the brain and the spine, and the doctors weren’t sure what was going on. They finally pinpointed it as meningitis and got me on the right antibiotics. I spent another four weeks in recovery. After getting sick, and by the time I got out of the hospital, I had lost about 85% of my movement from the lower rib cage down. Obviously, that includes innards, bowels, everything. My legs were pretty much numb. It was a very intense experience. Ultimately, the meningitis caused a myriad of problems that no one knew what to do with. I was having a tremendous amount of back issues, but because I looked strong, they assumed it was all structural. The MRIs showed that my back was a mess, but I was able to hold that mess together because I was strong. Once my strength left, the collapse starting happening. Basically, I didn’t have any real medical support because they didn’t know what to do with me. Again, I looked strong, but functionality was nil. Unfortunately, they decided what I needed was a spinal fusion. I had already had two decompressions. Despite my asking all the right questions, a procedure that never should have been done was done. What was happening was neurological, from the meningitis; it was not structural, and they went ahead and did the surgery. That was a whole journey in itself: the meningitis, and then the fusion; the healing from that, and then the realization, post-fusion, exactly how significant the loss of movement this would cause in my lower back. It changed my life and set me on a course involving a lot of pain and a tremendous amount of work. My emphasis to anyone reading this, who might be contemplating such a surgery, is to think very carefully about what the loss of your entire lower back really means. No one is going to be able to explain it to you. Especially as a dancer or athlete, you know better than they do. You have to really weigh this before agreeing to such a surgery. Photo provided by Robert Weber, Jr.
What it meant for me was a lot of confusion. My body and my back were accustomed to a particular range and scope of movement, and that was now gone… or, so I thought. This was a time of deep discouragement, feeling as though nothing would be able to help me find my body and movement again. After about a month in the hospital, in which I was in intensive care for the first two weeks, they put me into a special ward to start recovering. This was at Mount Sinai Hospital where Christopher Reeves had been; it’s a fairly famous ward where you go for two weeks after a spinal incident. There, we were doing the most fundamental of things. We were learning walking movement, going up and down stairs — basic fundamental strength movement, none of which I needed at the time. The reason I say that is because there is a difference between someone who has massive knowledge about physicality, and those people who have not used it. There just is. So unless you introduce that person who is used to a lot of movement immediately back into what their body remembers as movement, you’re limiting their neuro-connection to everything. I was quickly dissatisfied. I even had a physical trainer come to my house twice a week for about two months, and I was getting nowhere. It was frustrating because quite frankly, I just knew more than he did. Aside from the Gyrotonic training, I had also done Pilates training, and had taught both of those methods. When you acquire that knowledge in range of movement, and then you receive standard issue care as therapy, it can be frustrating. Of course, it can be good to strengthen small things, but if you are ambitious, or just want more for your body, the standard physical therapy is not going to do that. It’s a lot of pain, a lot of hard work, but you have to start somewhere. Yoga was my starting point. I came to Cincinnati to stay with my parents and rehab. I began to find physical strength again, and through that, find my will to pursue what it meant to go through all that I had gone through. I began getting back the physicality and eventually found Julie at Body Mind Balance. That’s when I got back into the studio to rediscover the Gyrotonic work. Right from the start, it was extraordinary to me that even though so much was gone, as soon as I got on the Gyrotonic Pulley Tower, that feeling of movement and expression came back. It was the first time in probably four or five years that I realized it was possible; I could come back and have a physical body to work in, as opposed to just a functional body, which is what the western doctors deemed enough. For me, that was not enough. Obviously, there are times when I work too hard, pinch a nerve, and the left leg goes numb. Then it’s days of being in bed and trying to figure things out. But I’m getting there. One of the biggest gifts, and one of the reasons I feel so fortunate, is that I had a prior knowledge base from the Gyrotonic and Gyrokinesis training before the injury. Then, coming back into it, my body recognized so much and could tell me where I needed to go. It let me know this is what was going to bring me back. I’ve stepped up coming into the studio and doing the work. Walking is my biggest problem; I can’t walk without experiencing a great deal of pain, and I can’t walk very far. But my static movement, and my movement in yoga, is becoming much richer. I’m having much greater ease in those movements. My body is becoming much stronger. While I do say I’m still having trouble with walking, I’m learning so much about what not to do. Inevitably, when you are in constant pain, your body and mind reflect that. So just opening up and allowing the strength in the hips and the core, lifting you up out of your lower back, really helps. So those are some of the enormous benefits I’ve had from the Gyrotonic and Gyrokinesis work. I could not recommend it more highly, especially to injured dancers and athletes. To those who are considering only a traditional western solution to a problem that is as profound as a lower back injury – unless it’s catastrophic like a car accident or massive, sudden compression – wait and find these other methods of healing first. Do the work and look for the information; it’s out there. I know it can be hard to find, and when you’ve suffered an injury like this, you don’t feel like there is much hope. There is. The point of that is this: having your body traumatized with such invasive surgery twice, and having the muscles and the nerves manipulated, was and is a big factor in my recovery. I’m trying to kindly suggest to the muscles and the whole nerve center that there is a way around this. I say, ‘gently,’ because I can force myself into positions, which is not generally a good idea ever, especially if you have a chronic back condition. You want to talk to your body and let it talk to you. It has to be a mutual conversation. The expression of the body is profound, and the loss of it equally profound. Also, the guiding of oneself back into that expression after a traumatic injury is also profound. I feel the difference in how this work affects my body the most when I’m doing the work. It is starting to translate into the physicality of walking. I am now much more aware of how I walk. When I first returned to the tower, the benefits were immediately clear to me. It was that feeling of weightlessness, feeling of being in water, that feeling of lack of restriction from gravity on my spine and my body. Just the energetic lift alone is a beautiful thing. As my work with it progressed and we got into more micro movement — because all of the things I need to circumvent are so much smaller than I realized — I have seen progress and breakthrough. I have been able to find my ‘core’ for this body. The profound part of this work is finding that core, or “seed center,” no matter where you are in your body, or who you are. I believe that’s what we have found, so I have a lot more hope. This work is about the beauty of movement, the variety of movement with endless combinations, the breath that it introduces into your body, and the well-being as a human on this planet. I am very thankful that I can live here, have my folks, and have Julie’s studio just five minutes from my house. When people ask me what this work is, I find it nearly impossible to translate. Trying to describe the circular nature of the work, what it does energetically to the body, and that there really is no comparison, is hard to find words for. It’s a hard concept until you actually do it. When I do try to describe it, I try to inspire in people an image of this vortex of energy that you can tap into when doing this movement. I use words like weightlessness and circular. 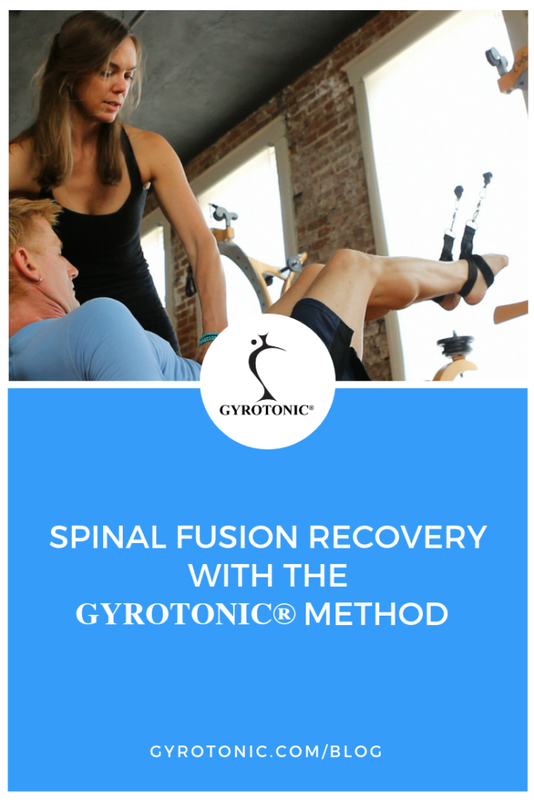 Most other modalities don’t explore the circular movement of the body the way the Gyrotonic work does. You just don’t get that anywhere else. When Robert first contacted me and when I first met him, I really didn’t know what I could do for him. He had come into work out on his own, before our session, so I was able to see what he could do on his own. That gave me a bit more information on where I could take him and what I could do with him. When I started to move with him, I started to see what was going on with his body. I wanted to explore was if it was possible for him to feel some sort of undulation or pulsation in his spine and lower back. So warming up the area and laying down for hamstrings was going to be more of indirect stimulation, just to see what his range of motion was. The biggest thing for me was to see if there could be small movement and small support, especially when he got into the sitting position. Once we got there, we did simple rocking forward and back, pulsations, allowing for as much gentle motion to move into the area as possible. Also, I was looking at his hips to see what kind of articulation was there, and what kind of support there was for his lower back. One of the things I noticed with him was his walking. There was very limited movement in his legs, articulating back. I was interested to see if we could open up a lot more to provide him with more movement in the hips, and to allow more freedom in his back. Because his legs stayed more in front of him, his back got tighter and tighter, and his movements got more and more stiff. I knew that wasn’t going to be helpful for him in the long run. I’ve just been a small guide for Robert, providing basic building blocks and ideas of how to progress the work. I’m alongside him as someone supporting him in his own care. As we’ve worked, it’s been amazing to see how beneficial this work has been, and how’s he’s taken the little pieces of information that I’ve given to him and really stayed with it, consistently. After each session, he’s feeling stronger, he’s feeling the work build on itself, so there is a consistent development from session to session, establishing a strong foundation. It’s been really great for him to feel that, for me to see it, and know that we’re on the right track with all of this. To find Gyrotonic or Gyrokinesis classes near your, please visit our international Studio Finder.